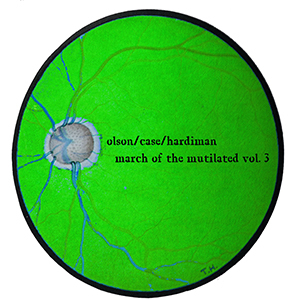 Brainwashed - Olson/Case/Hardiman, "March of the Mutilated Vol. 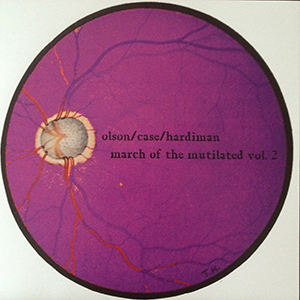 2 & 3"
Olson/Case/Hardiman, "March of the Mutilated Vol. 2 & 3"
In what has become a yearly tradition, Wolf Eyes member and meme master John Olson again hooks up with Upstate NY's Eric Hardiman and Jeff Case to deliver two more discs of psy jazz/free improv/whatever sessions from Case's basement studios. The progression throughout these latest two installments of the March of the Mutilated series is indicative of a clear trajectory, with the trio keeping some things constant, but also a significant amount of change, evolution, and hints at what may be to come during the holiday season of 2018. Volume 2, recorded at the same time as the first in 2016, consists of two lengthy workouts that fit most clearly in line with the first edition I previously reviewed. The jazz vibe is once again strong here, with Hardiman and Olson locking horns right at first, though in a calm, laid back sort of way. Some tremolo heavy sounds pop up in the background to flesh out the mix a bit, helping to blend the hushed moments with some heavier outbursts. All the while Case keeps the flow going with admirable restraint, adding just enough to make his presence known but letting the sax and reeds do all the work. Things build in intensity and the two trade off between taking the lead and providing the atmosphere, as the drumming eventually comes a bit more into focus. The second half picks up where the first left off, with the percussion right off the bat. Olson and Hardiman subject their instruments to untoward abuse, making for a multitude of wheezing and pained noises, slowly drifting through. As the 20-plus minute piece goes on, things shift towards the darkness, with some droning synth added. There is a heaviness throughout that remains strangely melodic and eventually relents, closing on a more relaxed note. Volume 3, recorded on the eve of Christmas Eve, 2017, features the trio bringing a lot of new toys to the session in comparison, and the four lengthy parts really reflect this change in direction. There is less of a jazz heavy feel right from the start: a mass of plucked and scraped strings from Hardiman's guitar conjures up some free improv moods. What sounds like crickets far in the distance may be electronics, or may be actual field recordings, and Case brings in a distant electronic rattle. There is still a good deal of restraint, but the complexity builds, and some percussive aspects and noisy scrapes are blended with Olson's reeds coming in quietly. By the end, they link into a simple but effective melodic progression that solidifies as a brilliant bit of horror film score tension. The reeds and woodwinds continue into the second part, but here they are less tense overall and instead, with the full arrangement, comes across like a deconstructed, abstract take on a spaghetti western soundtrack. The electronics take on a metallic edge, percussive bits build, and the pained sax and horns squeal through violently, resulting in something not far removed from some of Wolf Eyes' best moments, albeit reduced to the barest essentials. By the third segment the expansive twinkling electronics and rattling guitar take the focus, and when Olson’s horn starts in concert with Hardiman's guitar, it is a brilliant bit of chaotic free improvisation. The final segment nicely ties things together and brings the feel back to the previous installments of the series. Wheezing wind instruments and far off electronics pair together, with improvised percussion subtly punctuating the entirety of the piece. There may be a few outbursts towards the end, but the trio tie things up on an excellent note, nodding to not only the previous sessions on the disc, but their entire body of work. With the addition of guitar and more electronics on Volume 3, it is clear that Jeff Case, Eric Hardiman, and John Olson still have much more in reserve for these holiday jam sessions. I personally appreciated the way that the second volume continued nicely from the first, but by the third the trio were going on a very different trip, with varied instrumentation and playing styles. It makes for a series of recordings that seriously just keep getting better and better, and I have my fingers crossed that, in a cold Albany basement between Thanksgiving and Christmas of this year, these guys will be throwing down at least a fourth volume.